After months of frantic brinkmanship with North Korea, reports say President Donald Trump is now preparing for a summit meeting with North Korean leader Kim Jong-un. This would be comical if it wasn’t so dangerous. He has played right into North Korea’s hands. Trump no doubt thinks that his tough rhetoric has struck fear into the heart of the North Korean leader, Kim Jong Un, who is now seeking a negotiated settlement. Instead, Kim has read Trump perfectly and has outplayed him at every turn. Kim is playing a clever game of jiu jitsu diplomacy, turning the momentum of Trump’s saber-rattling back on him to achieve key North Korean goals. 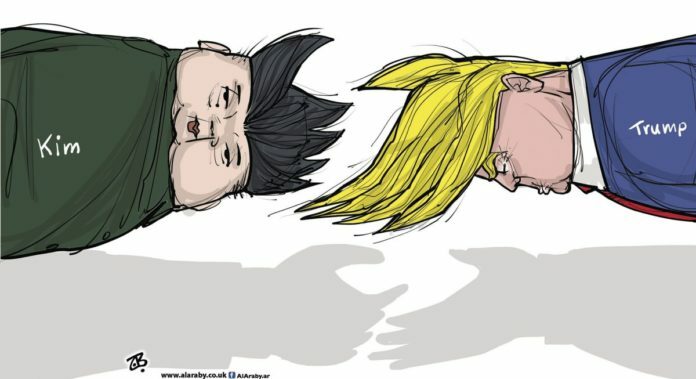 Kim has met every Trump threat with a counter-move of his own. Kim fires rockets while Trump fires tweets, in the process driving a wedge between the United States and our ally, South Korea, and pushing China farther away from us and closer to North Korea. Early in his presidency, Trump believed he could persuade China to exert pressure on North Korea to curtail its nuclear program. This effort failed, as anyone who knows the first thing about Chinese-North Korean relations could have told him it would. Instead, Trump has driven China even closer to North Korea, as the recent summit meeting between Kim and Chinese President Xi Jinping demonstrated. More than that, by withdrawing from the Trans-Pacific Partnership and imposing sanctions on China, Trump has further eroded U.S. credibility and influence with China and in Asia more generally. Kim will continue playing the jiu jitsu game because it is working. The latest gambit is his hint, during his summit with Xi, that he is open to discussing the denuclearization of the Korean peninsula. If Trump thinks this means his “pressure” on North Korea is working, he is in for some bad news: Kim didn’t mean it. He will use this spurious “offer” as bait to draw the United States into a negotiation on terms most advantageous to North Korea, beginning with the simple fact of a summit meeting — which any American president could have had for the asking, but which all of them were too smart to pursue, until Trump came along. Where does that leave us? Worse off than where we were before Trump, that’s for certain. North Korea has gained the upper hand. Thanks to our disjointed approaches that mistake tough talk for effective policy, North Korea is riding higher than at any time since the end of the Cold War. Where do we go from here? We should start with a dose of reality. North Korea is not going to give up its nuclear program, and there is nothing we can do about it. Diplomacy and threats won’t do it, because North Korean leaders are convinced that nuclear weapons are vital to their security, and there is no viable military option. A U.S. military strike would, at best, be only partially successful, and it would surely lead to a North Korean counter-strike against South Korea, with potentially catastrophic consequences. We need to replace the tough talk and wishful thinking with smart diplomacy and serious statesmanship. We should try some jiu jitsu diplomacy of our own, turning Kim Jong Un’s newfound interest in summit diplomacy into a reinvigorated six-party framework among the same six countries that brokered the 1994 North Korean nuclear freeze: the United States, China, Japan, Russia and the two Koreas. The immediate goal would not be denuclearization — which is simply not in the cards — but rather a regional security framework that reduces the risk of military confrontation and puts more effective pressure on North Korea. From that beginning, a realistic goal for the medium term would be to induce North Korea to suspend further development of its nuclear program in return for certain reassurances on the part of the United States and the regional powers. This approach is not perfect, but it is far preferable to playing nuclear brinkmanship under the dangerous delusion that we can force North Korea to give up its nuclear arsenal.